I’m a huge fan of farmers’ markets . Not only is much of the produce local + organic, but in many cases, it’s also much more reasonably-priced than supermarket fruits/veggies. Once a week, we take a trip to the local farmers’ market, basing our week’s meals around whatever tasty, in-season produce we picked up. Last weekend, I came home with a huge amount of kale and cauliflower. Wanting to try some new-to-me recipes, I took to my Facebook page to ask for ideas. And y’all did not disappoint! I’ll be sharing the results of your wonderful suggestions in the upcoming weeks! In a large skillet over medium heat, cook the bacon, stirring occasionally, until crisp. Remove the bacon pieces to a paper towel-lined plate to drain, and pour off all but 2 tablespoons of the bacon grease. In that same skillet, add the onions and garlic, and saute for 5-7 minutes, until translucent and softened. Add in the kale, and cook until the leaves turn bright green, about 1 minute. Add the cooked bacon back in, and saute for another minute. Then, add the cooked quinoa, soy sauce, and salt and pepper (to taste) to the skillet. Cook for 3-5 minutes, stirring occasionally. Add the raw egg to the skillet, stir, and cook for another 3 minutes. 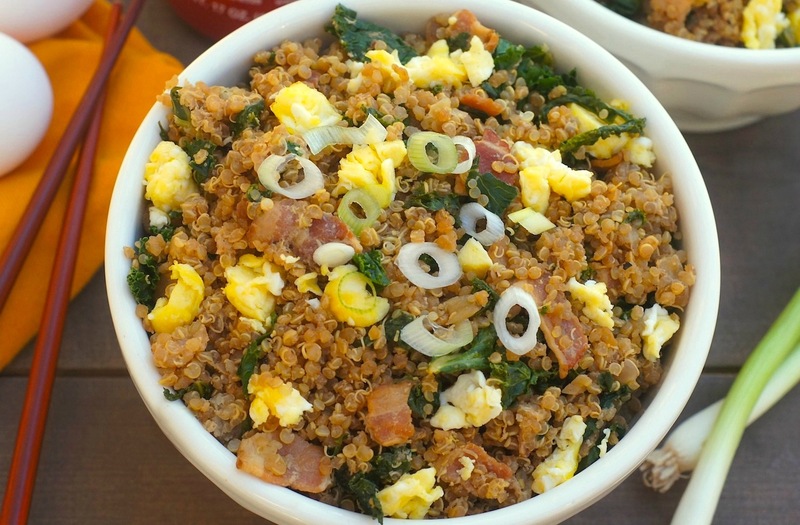 Allow the “fried quinoa” to sit in the pan for about 45 seconds between stirrings (you don’t want to constantly mix it). Add the crumbled scrambled egg, cilantro, and green onion, toss to combine, and serve immediately with an extra garnish of green onion, if desired. This sounds really tasty + I love how quickly and easily it comes together. This would be such a perfect weeknight meal for us. Love all the ingredients in this one. And how beautiful + colorful the end product is! I’m so jealous you live in a place where there are farmers markets right now! Can’t wait to get me some local and fresh produce pretty soon here in Minnesota. 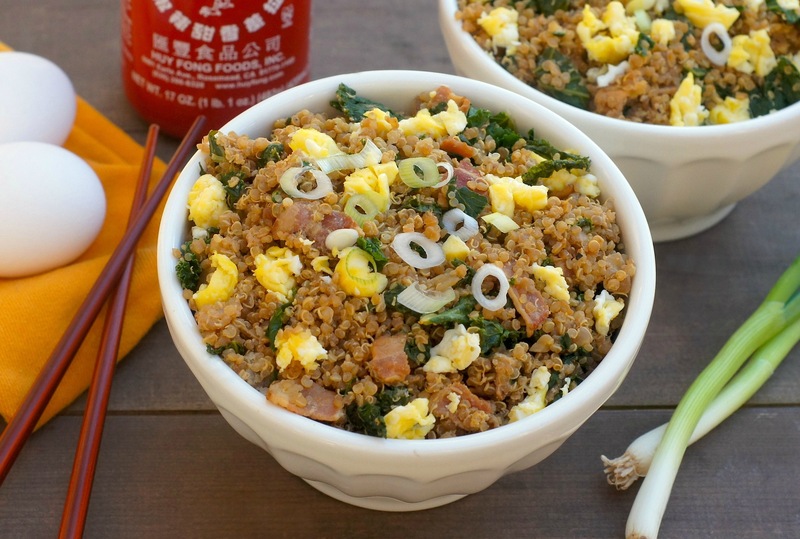 This fried rice looks awesome…love the kale and bacon together! Taylor, we actually have a brick-and-mortar Farmers’ Market that is open all year ’round! While the produce pickins are slimmer in the winter, we do have access to fresh produce all year long, which is great. And then, lots of different neighborhood markets pop up from March/April – October, which is fantastic! This is so interesting, I love getting tried and true recipes from other cooks! I love farmer markets, can’t wait for the season to be here where I live. Bacon, kale, and quinoa??? Oh ya this glutton is making this. Yum! Absolutely divine!! Great texture, light AND filling. Superb Friday night dinner!! I’m so thrilled you loved it, Meghan! Wow, but this sounds good. I bet all the different textures, plus the nice bite of the quinoa make for one satisfying meal. Thanks! Ooh, you must check it out Sarah! Not only are there great produce stalls, but some really amazing lunch restaurants, too. Enjoy! I made this for dinner tonight and it was delicious. I accidentally used millet instead of quinoa, but it turned out great. My husband who doesn’t really like the texture of millet even said it went well in this dish. Next time I’ll be sure to try it with quinoa. This looks SO good, Amy! Can’t wait to give it a try!